Recently, I turned 50. I can’t quite believe it. I remember when my mother turned 50, and when my father did. I remember my parents’ 50th wedding anniversary–I came along 11 months into their marriage, so it wasn’t too long ago. It has had me thinking about a lot of things… but central among them is how crucial connections with other people are in my life. I feel blessed and lucky to be loved by my family of origin, to have an extraordinary family of choice which includes a rather spectacular daughter and a delightful fairy goddess-son. And to have so many friends who see me, honour my life by being part of it and love me through thick and thin. These people make me who I am, and make my life immeasurably better than it would otherwise be. The picture doesn’t do it justice–but this cake was made by one of my nearest and dearest–the bunting is held up on two knitting needles–and the tablecloth celebrates a tree at the end of the street where I once lived and where my beloveds live now. So wonderful. Turning 50….. a special time! I remember my 50th (seems so long ago!). You are beloved by all…… ! Happy 50th and for another 50 more! Happy birthday! 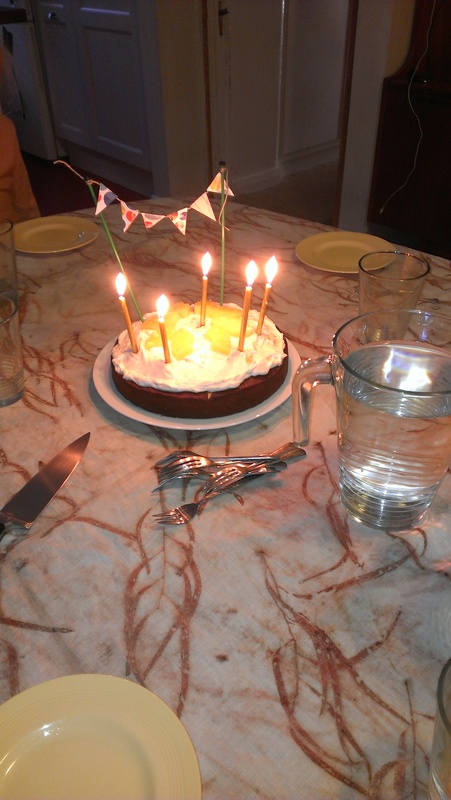 Funny how it ends up being less traumatic than you think it might….Many many happy returns. Lovely cake and table decor too. You are lucky in your friends and family. I am deeply lucky 🙂 Thanks so much! OH that cake was totally Brilliant!!! What a treat having a beloved family and close by. Happy Belated Birthday! !